A case of West Nile virus recently confirmed in a person in Barton County, is the first human case of 2017 in Kansas. State health officials confirmed the appearance of West Nile this year in a press release on June 9th. The unusually early appearance of West Nile has led state health officials to hypothesize that it may continue to appear more frequently in the coming months, earlier in the year than it usually does in Kansas. Four mosquito pools have tested positive for West Nile. The pools were Culex species of mosquitoes, which can spread West Nile (but not Zika, if that's any reassurance). The pools were in Reno, Shawnee, and Johnson counties. Officials also found two infected birds in Shawnee County. The virus can cause potentially fatal neurological disease in humans, although 80% of those infected do not have any symptoms. 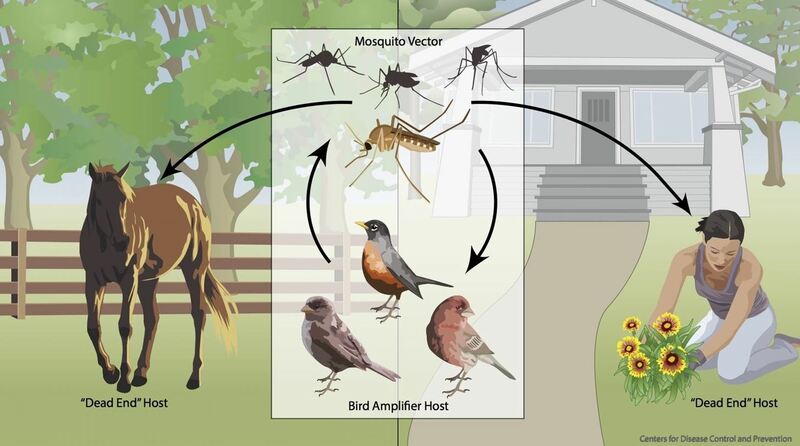 West Nile virus generally moves between birds (which are its natural hosts) and mosquitoes, but it can infect mammals including people and horses. Human infection is typically from mosquito bites, though it can also occur from contact with birds, other mammals, or their blood and other tissues. People previously infected with West Nile are considered to have developed immunity. Recommended precautions against West Nile are mostly the same as one would otherwise take for avoiding contact with mosquitoes. The Kansas Department of Health and Environment recommends using "insect repellent containing an EPA-registered active ingredient on skin and clothing, including DEET, picaridin, oil of lemon eucalyptus or IR3535." Screens on windows and doors should also be used to keep mosquitoes from getting inside. When possible, standing water should be removed or frequently changed, to prevent mosquito breeding sites. People should limit time spent outdoors, or wear insect repellent and clothing that limits skin exposure, around dusk and dawn when Culex mosquitoes are at their most active. The elderly and immunocompromised are especially advised to consider limiting time spent outside during dusk and dawn. The incubation period of West Nile is usually three to 14 days. Among the 20% of infected — who may be asymptomatic — the effects of West Nile can range from relatively mild West Nile fever to more dangerous neurological West Nile disease. West Nile fever symptoms include fever, body aches, headaches, and nausea, as well as sometimes a rash on the torso and swollen lymph nodes. The more severe form of West Nile disease, neuroinvasive disease, occurs in an estimated 1 in 150 of those infected and has an increased risk of death. The symptoms include "a headache, high fever, neck stiffness, stupor, disorientation, coma, tremors, convulsions, muscle weakness, and paralysis." The first case this year in the US was reported on May 18th in Nevada. The virus first arrived in the US in 1999, beginning an outbreak that lasted until 2010; it has since become widely established in the Americas, as far North as Canada and as far South as Venezuela.